An Indian bride has walked out of her wedding after her bridegroom-to-be failed to solve a simple maths problem, according to police in Uttar Pradesh. The bride asked the groom to add 15 and six. When he replied 17, she called off the marriage. Reports say the groom's family tried to convince the bride to return, but she refused saying the man was illiterate. Local police said they mediated between the families, and both sides returned all the gifts given before the wedding. Most marriages in India are arranged by the families, and it is common for a bride and groom to get married without spending time in each other's company. A police official of Rasoolabad village where the incident happened told BBC Hindi that local resident Mohar Singh had fixed his daughter Lovely's wedding to a man called Ram Baran. "But just before the marriage ceremony Lovely came to know that Ram Baran is illiterate and she refused to marry," he said. Mohar Singh told the Associated Press news agency that the "groom's family had kept us in the dark about his poor education". "Even a first grader can answer this [the maths test]," he said. Last month, another bride in Uttar Pradesh married a guest at her wedding after her groom-to-be had a seizure and collapsed. 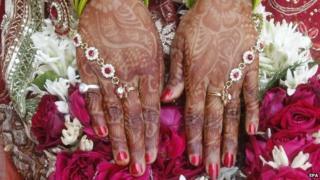 Reports said the groom was epileptic and he had kept the information from the bride and her family.